What will Newcastle and Seven Stories look like in 2065? Over 500 people visited Seven Stories over the course of our Big Draw weekend. 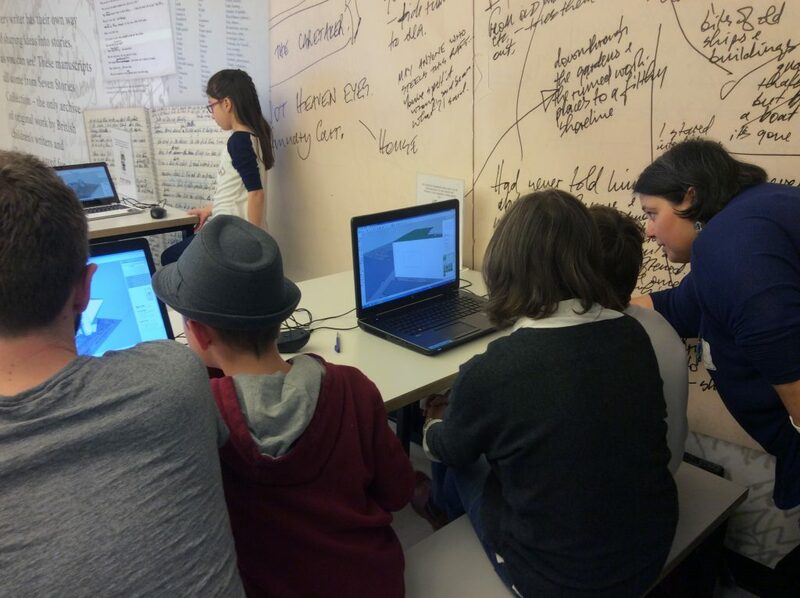 2016’s STEAM Powered Big Draw Festival aims to inspire illustrators everywhere to explore creative innovation, enterprise, digital technologies and the arts through drawing. This seemed like a perfect theme for Seven Stories to connect with the Newcastle City Futures Urban Living Partnership, a project led by Professor Mark Tewdwr-Jones at Newcastle University. Newcastle City Futures aims to get people and organisations in Newcastle Gateshead talking and thinking about the future needs of the city, and working together to foster innovation. Now, I think the views of the children and families visiting Seven Stories are pretty important here. After all, they’re the ones who’ll be living and working in Newcastle in fifty years’ time! Over the course of the weekend, children and families added to our large map of Newcastle and Gateshead to create their vision of Newcastle in 2065. And their creativity was amazing! Visitors built homes, cultural, sports and science venues, businesses, hotels, transport systems, power stations and several bridges. In fact, the children organically created pretty much everything you’d need in a future city. I was pleased to see they thought the Angel of the North would still be there, and Seven Stories too! The house of the future…? Children drew on (and played in!) our large 3D house of the future. What does this tell us? 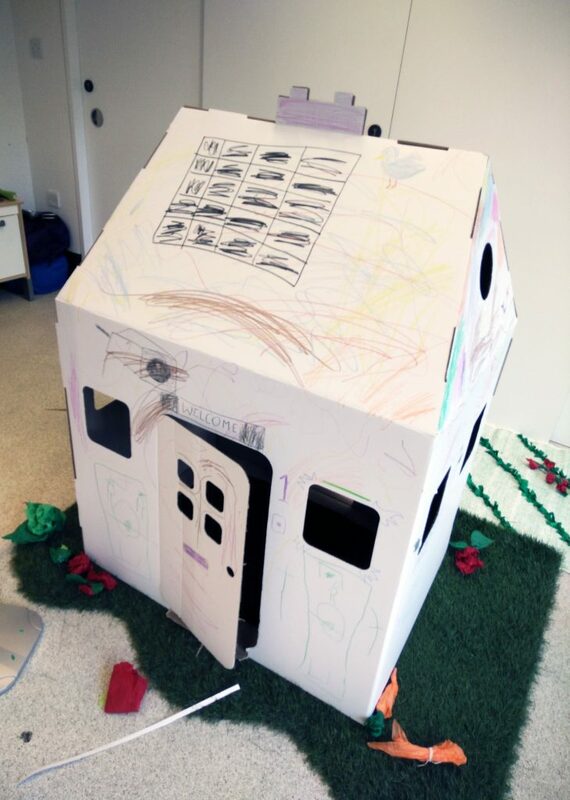 Perhaps that houses in the future will be more colourful and allow for personalisation. We’ll continue to build in green technologies, and graffiti won’t be going away any time soon…! We drew on RFID enabled wooden jigsaw pieces and recorded messages about the future of the city. Image: Newcastle University. Zander Wilson of Open Lab at Newcastle University provided a fun jigsaw activity. 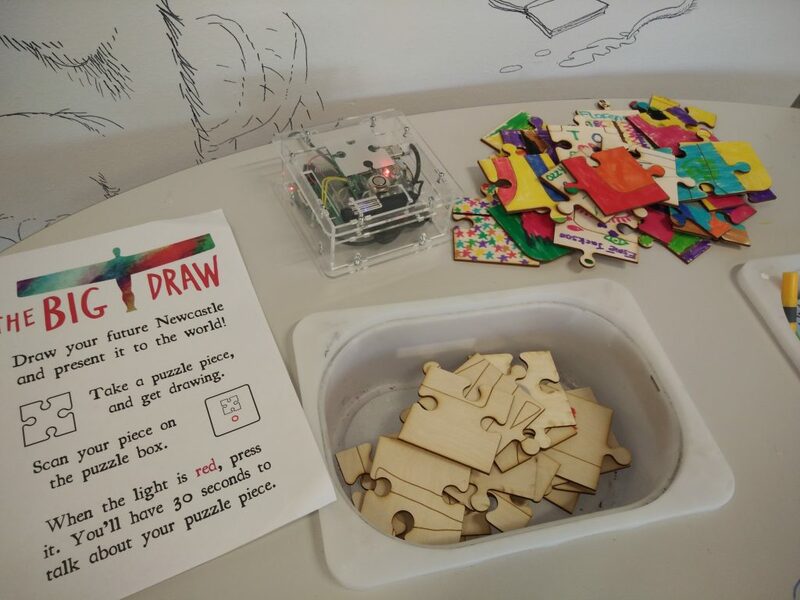 The children coloured in wooden RFID enabled jigsaw pieces, before recording a message about their hopes for the future of the city. Zander will be combining these to make a digital jigsaw – I’m excited to see the finished result! Our last two activities of the weekend were all about planning the future of Seven Stories. 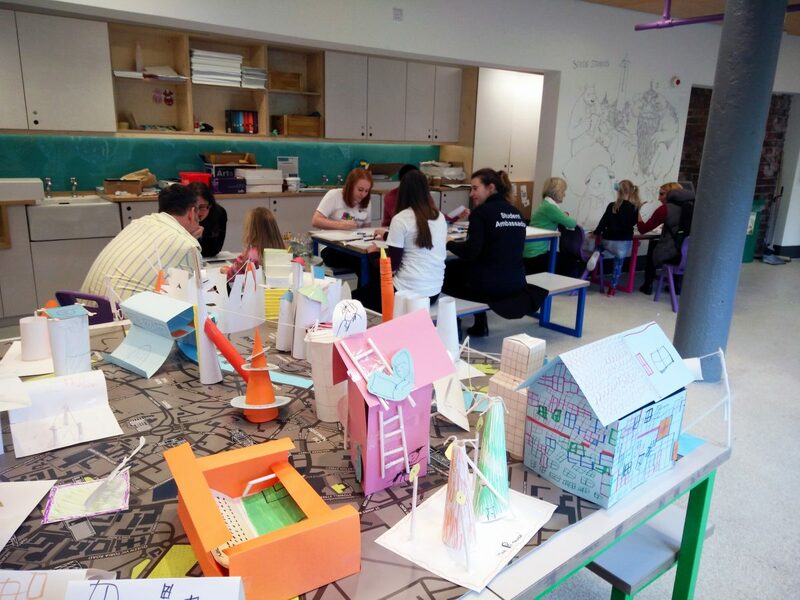 Throughout the weekend, children could draw a new blueprint for our galleries, and Teresa Strachan and the YES Planning students at Newcastle University came to deliver a drop-in workshop all about urban planning. 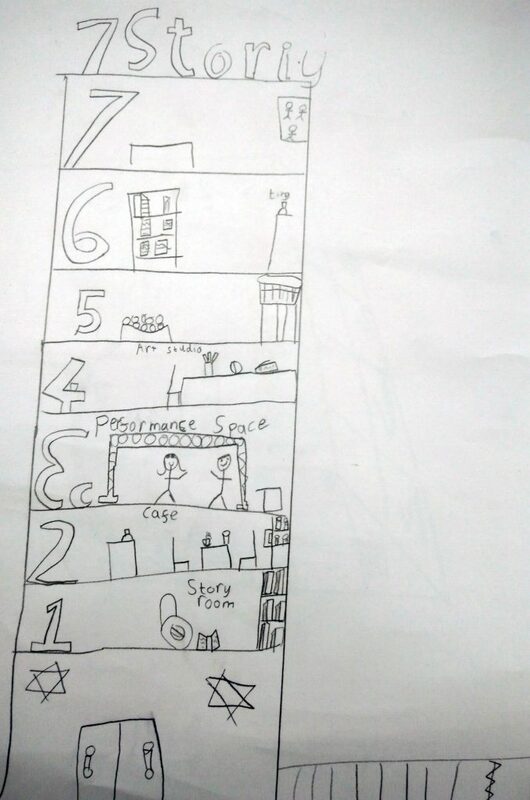 Here’s a plan one of the children came up with! 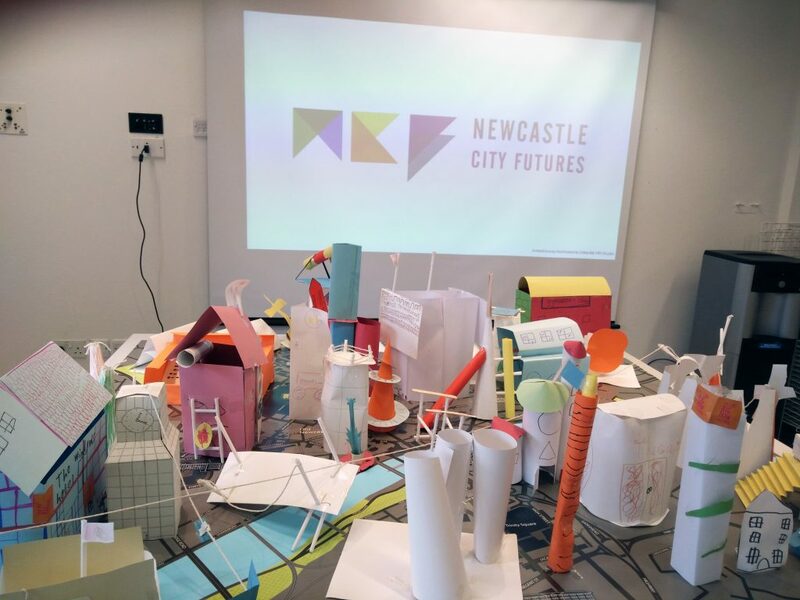 The children came up with so many interesting ideas about what Newcastle Gateshead will be like in 2065 – I’m looking forward to seeing what changes the future holds!